When you set up your personal space, you want it to feel comfortable. 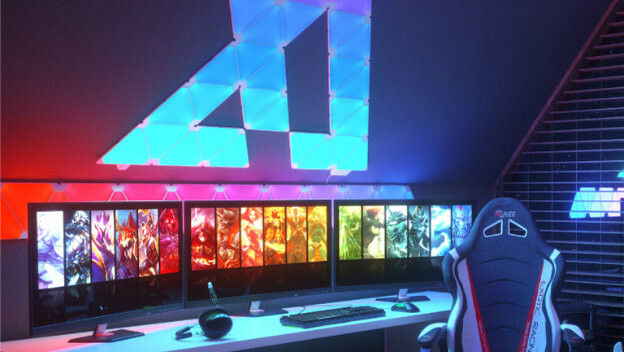 Whether it is a bedroom, gamer den, or studio space, it has to feel inviting and make you want to spend as much time as possible there. That means you need to have essentials, like solid light sources, as well as decorations that make it inviting. Should people be up for a new look, there is a way to meet both needs. Nanoleaf lights let you take different panels to create an incredibly cool design on your wall or other surfaces, providing lights and colors to enjoy. Here’s how the Nanoleaf light panels work. Each one is a triangular panel with lights and all sorts of different light variations. These connect to one another and can be affixed to walls and spaces by using the linkers, mounting stencils, and mounting strips included in each box. Once you have them connected in a way that you like and in place, you plug it in, turn them on, and enjoy. The Android and iOS apps allow you to create and set color schemes and variations, known as Scenes. These can be shared, which means you can also rely on the ingenuity of others when designing your space. Now, the important thing to note about these panels and scenes is how versatile they are. The shape allows you to build up designs. It would be incredibly easy to make Resident Evil’s red and white Umbrella logo on your wall. If you are a fan of Hatsune Miku: Project DIva games, a teal music note could be the way to go. Want a Tri-Force that subtly shifts in a way that makes it appear to be sparkling? You can do that too. This is an opportunity to be creative, with different patterns making animated scenes on your wall that give light while also dazzling the eye and impressing anyone who watches. Controlling them is effortless too. The Android and iOS app might be the first thing people would turn to, since everyone has their phone around them. And there is a controller that people will be able to get that is a remote that is dedicated just to making your Nanoleaf panels perform the way you would like. But, this is also a smart device. They communicate with the Apple Home App, Amazon Alexa, Google Assistant, and IFTTT. 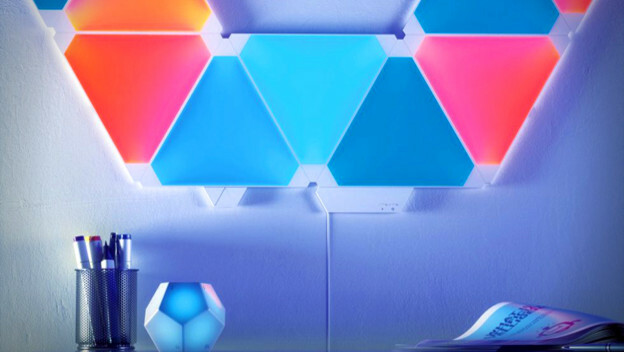 If you want something done and have one of these virtual assistants nearby, you can tell them how you want the Nanoleaf panels to look. Everything communicates, giving you what you want with a minimum amount of effort. There’s another element to the Nanoleaf lights that is incredibly cool and also involves sound, but not the sound of your voice. One of the featured packages is a Rhythm Starter Kit. For $229.99, this provides nine of the panels and the Rhythm Upgrade Module. This is a module that plugs into your panels and listens for audio in its vicinity. This could be music, a game, or a movie. When the panels “hear” those tones with this extra equipment, they react in kind. Think of it as having an equalizer on your walls. It would make quite the lightshow. I imagine it would be fascinating to have it react when hunting monsters in Monster Hunter: World, with the lights responding to the creatures’ shrieks. Hatsune Miku: Project DIva could spawn quite a rave with the Nanoleaf on the walls. And, if you feel like listening to music, it will be relaxing to watch them dance along. Our lives are being shaped in so many ways by technology. The Nanoleaf panels allow us to let a little light into our lives in a beautifully formed and functional way. When these panels are applied to the wall of a living room, bedroom, or game room, you completely change the atmosphere. Especially if you have the rhythm module equipped that picks up on all audio to let the lights dance. It is quite welcoming, providing the exact atmosphere you need for any situation.